Will your job exist in the future, or will a robot have replaced you? Imagine 20 years from now. Will the job you do now still exist? Or will you be working at a new job we can’t yet imagine? Economists tend to agree that parts of both of those storylines are true. Old jobs will die out, while technology will create new ones. Where economists disagree, however, is over what that change means for workers: will there be enough or the right kind of jobs to replace those that are lost? During the Industrial Revolution, the Luddites opposed technological advancement because they saw it as a threat to their livelihoods. Over the long-term, however, that advancement has come to be seen as a net positive for economic development and for everyone’s well-being. There’s reason to wonder, however, if this time may be different. That was the subject of a recent Hamilton Project paper and related conference, “The Future of Work in the Age of the Machine,” inspired by the New York Times best-seller “The Second Machine Age: Work, Progress and Prosperity in a Time of Brilliant Technologies,” co-authored by MIT professors Erik Brynjolfsson and Andrew McAfee, who appeared in one of our Making Sen$e NewsHour stories last year. This “second machine age” is so daunting because of the speed with which it’s advancing. And unlike the first machine age, Brynjolfsson told a room full of economists and policymakers in Washington, DC, Thursday, this one “is replacing minds as well as muscles.” Robots are now rivaling human intelligence. So while well-educated techies innovate to their hearts content, those Wal-mart associates who learned Thursday they’d be making slightly more an hour could one day find themselves out of a job thanks to the self-checkout machine. The jobs that survive will require human contact, McAfee and Brynjolfsson told us last year. But, as the Hamilton Project paper points out, many of those jobs, in the food service and elder care sectors, for example, are already the lowest paid. American wages, actually across the wage distribution, fell or stagnated in 2013 and 2014, according to a report released Thursday from the left-leaning Economic Policy Institute. One of the greatest puzzles in the American economy is why wages haven’t kept pace with an otherwise expanding economy. Since the 1970s, productivity in the United States has grown, while median wages have stagnated. 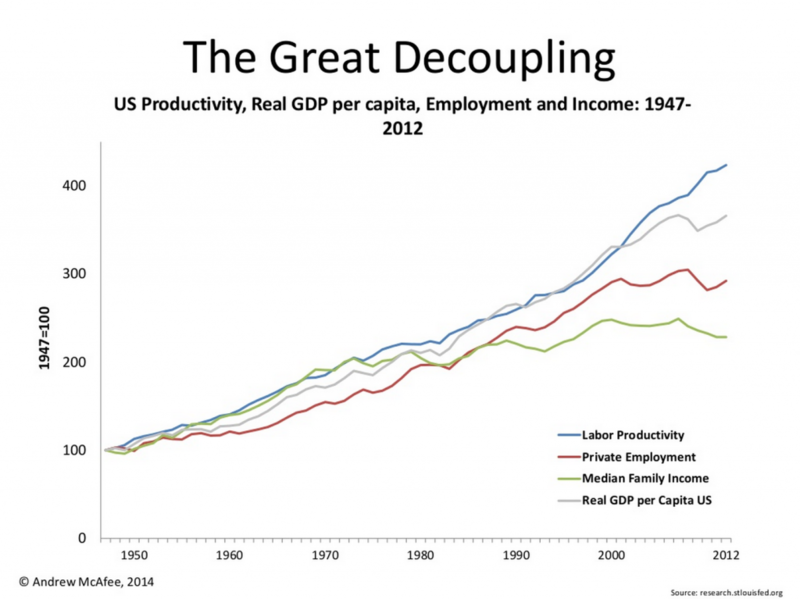 “The Great Decoupling,” Brynjolfsson and McAfee call it. In their Hamilton Project framing paper, Melissa Kearney, Brad Hershbein and David Boddy underscore the growing wage and employment gaps between the highest-end of the wage distribution and everyone else. Technology, they write, “may be playing an especially important role in driving the divergent labor market experiences of those with different types of skills.” A second machine age may only make things worse for low and middle-income workers. The fear, expressed by economists from Harvard’s liberal Richard Freeman to George Mason’s conservative Tyler Cowen, is that an innovation economy will be divided between the select few with the money and skills to innovate (and buy the resulting technology) and everyone else. “We don’t want it to be that there’ll 20 or 30 billionaires controlling everything, and the rest of us struggling for the one or two jobs that are out there,” Freeman told Paul Solman in 2012. A slightly more optimistic view at Thursday’s panel came from MIT economist David Autor, who suggested that rather than replacing workers, machines may become complementary, allowing some workers to do things they couldn’t do before. Maybe the economy will catch up and adjust to technological advancement in such a way that all displaced workers are eventually reabsorbed back into the workforce. Maybe it won’t. And evening supposing it does, what happens to those workers in the meantime? “Shame on us if we’re not using these tools to create more shared wealth,” McAfee said from a lectern at Washington’s well-appointed National Press Club on Thursday. Easier said than done. Is it really realistic to think, Hamilton Project Director Melissa Kearney asked Thursday’s panelists, that enough workers can acquire the skills to compete in a second machine age? Aneesh Chopra, former U.S. Chief Technology Officer and a member of Thursday’s panel, seemed to think so, echoing a common refrain in labor policy debates that a jobs-skills mismatch is holding back American workers. That didn’t sit well with everyone, especially the first panel’s policy heavyweight, former National Economic Council Director and Treasury Secretary Larry Summers. Skills training is simply “an evasion” of the problem, he said, the problem being the need for more jobs. “You’re just helping people win the race to get a job,” instead, he continued, of actually creating any more of them. As the Economic Policy Institute’s Elise Gould reported Thursday, among all educational categories, the greatest real wage losses between 2013 and 2014 were observed among those with bachelor’s and advanced degrees. “If demand for high-skilled workers were driving wage inequality, we would expect to see these workers’ wages increasing, or at the very least, falling less than their low-skilled counterparts.” But the demand is dwindling — even for them. There was a certain irony watching a stage full of well-connected panelists address their well-heeled peers about the future of work in one of Washington’s most “insidery” venues. Certainly, former Office of Management and Budget director Peter Orszag, who sat in the front row, and now holds multiple titles at Citigroup, isn’t too concerned about a robot taking over his leadership role. But as Brynjolfsson and McAfee remind us, the “second machine age” isn’t just coming; it’s here. And this time, it’s not just factory workers for whom the robots toil; they toil for thee. Left: In the "Second Machine Age," even white collar office jobs could be threatened by robots. Photo by Thomas Barwick/Stone Collection via Getty Images.